Chandigarh Management Association (CMA) in its endeavour of social responsibility towards less fortunate brethren of our society organized a Mega Health Camp jointly with Rotary Club New Chandigarh at Government Senior School, Khudda Lahora from 10:00 am to 1:00 pm. A team of doctors from Paras Hospital, Panchkula which included a Gynaecologist, a Dental Surgeon, a General Physician, an Eye Surgeon and a full team of pathologists worked hard to attend 98 patients in a short period of three hours. The team also performed free Random Blood Sugar and Blood Pressure tests. 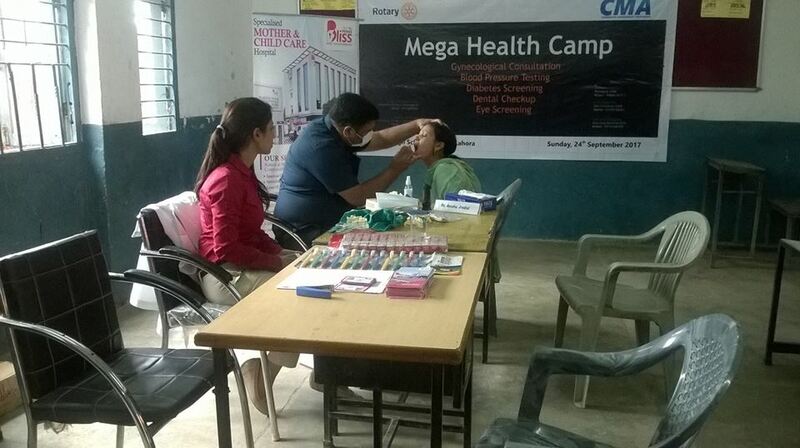 CMA along with Rotary club New Chandigarh actively participated in organizing this Mega Health Camp. Sarpanch of Khudda Lahora, Mr. Rakesh Sharma and Village Khudda Jassu, Mr. Balwinder Attri while appreciating the self-less move, motivated the residents of both the villages to avail this opportunity of getting free medical check-up by a team of expert doctors having specialisation in their own field. Dr. Sanjeev Jindal educated all the patients individually and collectively both about the benefits of maintaining oral hygiene in all ages. CMA arranged medical kits for distribution among patients. Dabur India Limited contributed by donating Tooth Pastes for this noble cause. Rotary Club New Chandigarh arranged for high tea for all the participants.